For over ten years, Grupo Falso Baiano has delighted audiences with their energetic blend of instrumental Brazilian choro, samba, and jazz. This project, featuring Brazilian vocalist and multi-instrumentalist Francisco Marques, explores samba de raiz – the authentic roots samba of Rio de Janeiro. Grupo Falso Baiano and Francisco Marques are one of the few groups bringing this swinging, celebratory sound to the U.S.
﻿$20 general / $15 students - No one will be turned away for lack of funds. 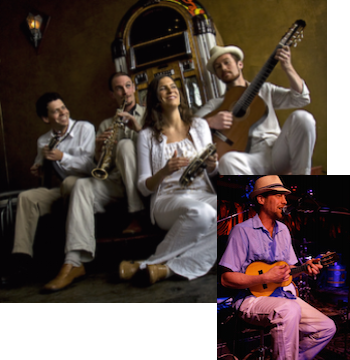 Grupo Falso Baiano, with Brian Moran on 7-string guitar, Zack Pitt-Smith on reeds, Jesse Appelman on mandolin (bandolim), and Ami Molinelli on percussion, is a choro group that offers a window into the history and diverse culture of Brazil. Choro is one of Brazil’s earliest popular musics, dating back to the late 1800s, and, similar to jazz, it reflects the melding of African rhythms with a melodic and harmonic structure closely resembling Baroque Classical music. Francisco Marques was born on October 12th 1978, in São Paulo, Brasil. He moved to the Washington D.C. area with his family in 1980. While in elementary school, his first exposure to a musical instrument was through piano lessons . At age 15 he began taking several years of private guitar lessons at The Guitar Gallery in D.C. with Stewart Payne. He continued his study of music at Colby College, Maine, where he focused on classical guitar but expanded his study of different instruments and musical styles including the West African Drumming Ensemble with master drummer Jordan Bennisan (www.jordanbenissan.com) from Togo West Africa. In 2000 Francisco graduated with a Bachelor of Arts in Music and moved to Boulder, Colorado where he quickly began to play at local venues; The Fox, Tulagi, and The Bluebird Theater (Denver) with the band “Bobby Milk”, opening for bands like Devotchka, The North Mississippi All Stars and the Dirty Dozen Brass Band. In 2003 Francisco’s musical career took a decided turn towards the Brazilian after taking a few private lessons from the local Brazilian specialist, Mitchell Long (www.mitchelllongmusic.com). It wasn’t long before he was playing with the Brazilian band, Sambadende (www.sambadende.com) and soon after, started his own Brazilian quartet, Ginga (www.gingaband.com) with Boulder’s woodwind specialist, Greg Laliberte. The band began with Gonzalo Teppa (www.myspace.com/teppagonzalo) on upright bass and Chris Lee on drums and soon incorporated renowned guitarist Bill Kopper (www.billkopper.net). The project that studied the musical traditions of both Venezuela and Brazil soon became a strictly Brazilian endeavour after Raoul Rossiter joined the ensemble and Gonzalo returned to Barquisimeto, Venezuela.